Durham Bat Group covers the area within the pre-1974 County Durham boundary (outlined in red below), including the part of Tyne & Wear south of the River Tyne, plus the former Startforth Rural District that was added to the current ceremonial county of Durham (outlined in blue) in 1974, comprising the Lunedale, Balderdale, Deepdale and Greta valleys on the south side of Teesdale. All calls to the National Bat Helpline from within this area are forwarded to group volunteers, and this is also where we focus our bat surveys and conservation work. Take the fellow to the left here. Pretty scary? Not really - he's only the size of your thumb, and those sharp little teeth are only a couple of millimetres long and designed for grabbing and chewing insects. He looks like he should be making a racket and probably is, but you won't hear it because he's using ultrasound - way above the range of the human ear - to find out what's around him. The echoes are picked up by those big bat ears enabling him to navigate. Bats can see perfectly well, but their echo-locating ability enables them to fly and hunt insects in the dark. Most people will occasionally see a bat flitting by at dusk, but few realise how ubiquitous they are. Wherever you are in County Durham and further afield, there are probably bats nearby, tucked away in nooks and crannies in buildings, trees, tunnels, culverts, or even piles of wood or rubble. Bats are legally protected because they live alongside us, and rely on built structures during much of their life cycle. In return they bring nature into our neighbourhoods, and make them more congenial in other ways - each bat can eat several thousand midges in a single night. Durham Bat Group exists to bring together people who are interested in bats and concerned for their welfare, and is open to anyone willing to devote a little time for participation in group activities. Explore this website to find out more, and if you'd like to get involved, see the membership page for further details. Do you have a bat emergency? Have you found an injured bat? Is there a bat trapped in your home or workplace? 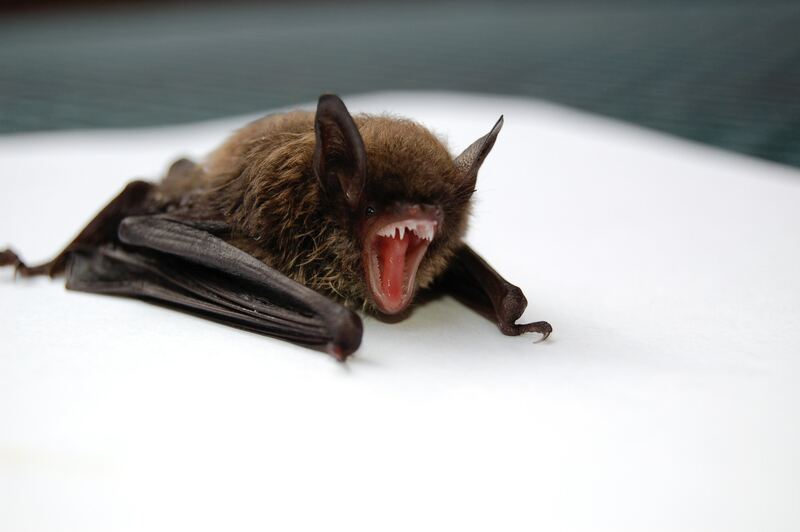 Are you concerned about bats roosting in your property? Durham Bat Group volunteers can provide help and advice, but do so as part of the service provided by the National Bat Helpline (0345 1300 228) run by the Bat Conservation Trust on behalf of Natural England, the government statutory conservation agency. Call the helpline and if the issue falls within our area, it will be forwarded to us to make contact with you and arrange to visit if this proves necessary. This enables the Bat Conservation Trust to monitor and coordinate activity country-wide, and to liaise with Natural England to enable it to fulfil its responsibility to provide public information with respect to bat conservation and legal protection. Prior to contacting the helpline, there are some steps you can take to help a grounded bat.. Contain the bat in a suitable lidded receptacle – a small cardboard box is ideal – but make sure there are air holes so the bat doesn’t suffocate. Wear bite proof gloves to pick the bat up, or else coax the bat into the box without touching it. There is an infinitesimally small chance the bat may be carrying a rabies-like virus, so bats should not be picked up with bare hands. Place a soft piece of cloth, such as a tea towel in the box – make sure it is crumpled up so the bat can crawl into it and hide. Provide some water for the bat to drink. An upturned plastic milk bottle top with a couple of millimetres of water is ideal. Place the box somewhere dark and quiet.